And cost for passenger trains in Rs.3/- and express trains Rs.25/-. It would good if more people start using the existing trains for daily commute and create a pressure on system so that IR will actually introduce commuter trains. Let me know if anyone needs more info on how to use IR trains for city commuting. is taking cycles in train allowed ? I had also tried, it is mostly on schedule , Tickets in passenger train is very cheap. There are monthly passes available also. I am not sure If they allow taking cycles in Passenger Trains, any information on the same would be helpful. Would either of you be able to give me similar train timing chart on the reverse side - i.e. from Whitefield to Contonement or City Station? I live in Whitefield and have often to take a train to Chennai . Is there anyway I can hop on to this IR trains at appropriate time to reach City/Cantonement from where I could catch the Chennai Train? Any light on this aspect would help please. I agree it doesn't work for you because u travel from hebbal to mahadevpura. Its useful for me because, from home i reach cantonment station by bus in 15 min + 40 min train journey+15 min from whitefiled station to my office at varthur kodi by big-1 bus. If i do the same journey by taking a bus to shivajinagar and then to varthur..on an average it would take me 1hr 30min to reach office, and on some bad days it can go upto 2 hours also. The train provides reliability in terms of average time taken to reach office, which the bus doesn't. One other big releif, unlike roads is there is no constant honking/pile up of vehicles. The comfort factor is high in a train. Admit we are resourceful, but, I think it is pathetic we have to make do with such workarounds while SWR/GoK cannot work out a mutually beneficially CRS for this city utilizing prime land within the city. 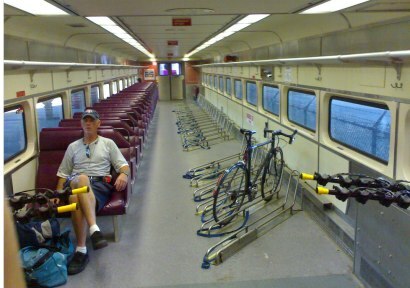 Meanwhile, here is a bicycle enabled train. If we have a commuter rail to Tumkur, Mysore, Doddballapur etc we may be able to run one of these. Thanks for the very good information and am sure you are motivating others to make use of the existing choices. I am in agreement with you that SWR can certainly help the city commuters by extending little help. Any ideas how SWR can help for the return journey in the evenings? Should it run some short distance trains say at a freq of 30-40 minutes? There are only three trains in the evening, out of which two are express trains making it diffcult to travel by trains in the evening. SWR should introduce a few more passengers trains from bangarpet-ramanagaram in the evening. SWR should should stop terminating of all mysore-bangalore passenger trains at the city junction and extend them all the way to whitefield-malur. Have a few ideas !!! Let me know if this helps. 1.Third Line between Bangalore to Ramanagaram.-Pressure by means of political will needs to be extended.You could look at chennai as an example where the presence of third line and fourth line has helped ease traffic into the city of chennai.Doubling is just one step.The railways need to plan for the future. 2.Electrification of Bangalore -Tumkur(Currently Double Line).Electrification would aid more MEMU Trains which are in sync with the latest trends and would faciltate growth of tumkur as a suburban town to bangalore. 3.Doubling of Yeshwantpur-Yelahanka and Yelahanka-Chanasandra lines which has been allotted a paltry amount of 1crore in the budget ,2009 this year.At This rate it would be impossible to complete this line for decades . Electrification i believe is the essence towards faster rail conectivity inside the city as it is non polluting and also aids in increasing the speed of rails. The present leadership by Mr.Muniyappa (MOS-Railways )should take personal initaiative towards facilitating commuter rail system in bangalore. Thanks a million Vinod for that link on the Whitefield to Bangalore City Station timings. Have taken a print out and pasted it on my desk! Metros and Monos are expensive stuff. Tracks within the city is highly valuable resources which needs to be best utilized. Just like satellite bus stations we need to have satellite railway stations at Yelahanka, Whitefield, Kengeri and Yeshwantpur. All the long distance trains needs to terminate here. These outer stations needs to be connected using circular track outside the city for trains passing by Bangalore as well as goods trains. Tracks within the city needs to be well used for Local Commuter Train. Also the edge stations should have good parking facility. After this point, vehicles entering the city should be tolled heavily to reduce the vehicle entering the city so that people coming in private vehicles to the city can park their cars at the edge stations and take the commuter rail or city buses. This may trouble people entering Bangalore city centre by train especially for elders and women since they have to change over trains, but, valuable resource of track within the city can be better utilized reducing the congestion and pollution. Other option is to have few limited trains entering city station instead of every train plus track quadrapling wherever land is available. I think these are excellent suggestions. I dont know why people in the Railway Board / Ministry and BMRCL authorities cannot think sanely like this? As in all cases related to infrastructure, Government's right hand does not know what the left is doing. Pity, clear thinking persons like yourself are not in the bureaucracy willing to take on the "system" in its entirity. Big10 on Old Madras Road? Is HOHO experiment being dropped?? ?